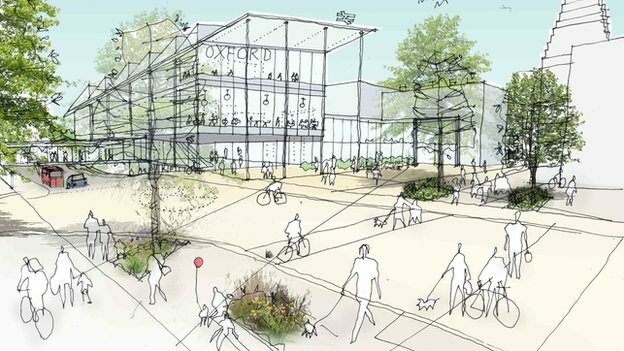 A masterplan for Oxford station, which includes a new bus station and upgrades to the area, is to be launched later. The development aims to attract investment and accommodate the expected growth in rail passengers over the next 30 years. The proposals include a new station building and a new rail track and platforms. There is also a planned transport interchange, which includes a bus station and multi-storey car park. Oxford City Council leader Bob Price said: "This is a vision for the development of a landmark gateway into the city. "It sets out ambitious proposals to meet the predicted increase in rail use over the next 30 years and will encourage wider regeneration in Oxford city centre and beyond." The leader of Oxfordshire County Council, Ian Hudspeth, said: "This is part of "connecting Oxfordshire", which is about ensuring the county has the transport network it needs to ensure we continue to attract investment and create jobs." There will be an architectural competition for the concept design of the new station, bridge and transport interchange. A public exhibition is being held on the 1st and 2nd August in the exhibition suite at the Westgate Shopping Centre in Oxford. Oxford City Council, Oxfordshire County Council and Network Rail are working together to develop the project in conjunction with Department for Transport and First Great Western.